There are some things that are just in ones blood. Take beer for example. In the long-gone days of my youth, I belonged to an abstemious tea-totaling church. On my very own honeymoon My Newlywed Majesty thought we should try the (free and ice-cold) beer at the end of touring a major east-coast brewery. It was a hot, humid, Virginia day in June and I wrestled with the idea. Having never had it before, I absolutely intrinsically knew that if I tried it, I would like it. I mean look at my surname! You Google that with a "de" for Deutschland and you get a tiny village of the exact same name just outside of Köln (Cologne), Germany in the region of Neunkirchen-Seelscheid! Beer is almost our middle name! Even when My Majesty and I were courting, my dad referred to her as Die Lorelei, the Rhine River golden-haired siren nymphet whose singing lured many unwary river-sailors their death on the rocks far below her perch. Anyway about the beer, I tried it, love it, and imbibe far too much of it to this day to sustain my manly-Bavarian style belly. And then there are the pipes. My first memory of a tobacco-smoking pipe was the occasional exposition of my great-great-great-Grandfather "K’s" pipe. To ease the word-burden from here on, let me refer to this particular ancestor of mine as Pappy K. Pappy K’s pipe eventually was passed down to my mother and now resides with me. It is one of the oldest of very precious few heirlooms in our family, dating, we think, from the mid-19th century. 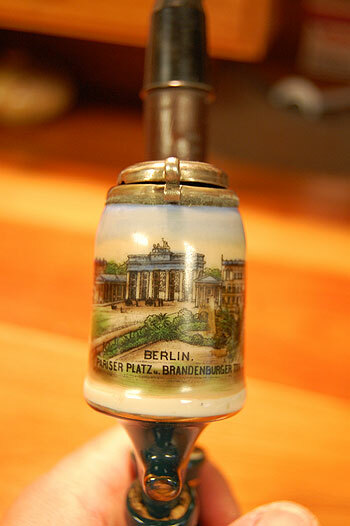 It’s a traditional German porcelain pipe variously referred to as a porcelain wine pipe, Tyrolean pipe, Black Forest pipe, alpine folk pipe, and several other variations on those themes. Starting at the tobacco burning end of Pappy K’s pipe, there are two glazed porcelain sections, a traditionally wind-capped bowl, and what I’ve heard more than one writer refer to as the "chamber-pot" section, or "wine bowl" as some nomenclaturists posit. I’ve actually heard lore that some Germans floated a little wine in the pot to both flavor and gentle their smoke. The two porcelain sections are fired with a deep loden-green glaze highlighted with thin delicate gold lines.